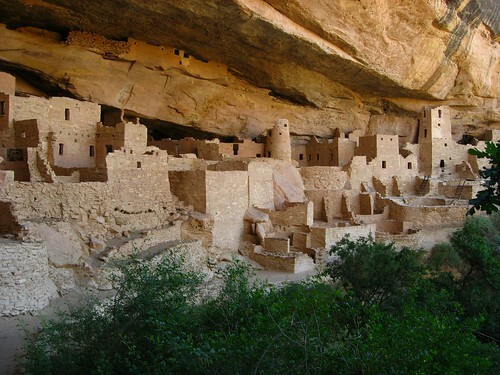 The Cliff Palace guided tour is a must-do at Mesa Verde National Park. Although you can get a great view of Cliff Palace without taking the tour, the tour makes it so much better. Cliff Palace is the largest cliff dwelling in North America. The Ancient Pueblo structure is located in Mesa Verde National Park, in the southwest corner of the U.S. state of Colorado, home to the Ancestral Puebloans people. Cliff Palace contains 23 kivas (round sunken rooms of ceremonial importance), and 150 rooms. One kiva, in the center of the ruin, is at a point where the entire structure is partitioned by a series of walls with no doorways or other access portals. The walls of this kiva were plastered with one color on one side and a different color on the opposing side. Archaeologists believe that the Cliff Palace contained two communities and that this kiva was used to integrate the two communities. The large, square tower on the right that almost reaches the cave "roof" was in ruins by the 1800s. The National Park Service carefully restored it to its approximate height and stature, making it one of the most memorable buildings in the Cliff Palace. Slightly different-colored materials were used to show it was a restoration. Tree ring dating indicates that construction and refurbishing of Cliff Palace was continuous from c. AD 1190 through c. 1260, although the major portion of the building was done within a twenty-year time span. Cliff Palace was abandoned by 1300, and while debate remains as to the causes of this, some believe a series of mega-droughts interrupting food production systems is the main cause.